College football is back and it looks to be an exciting season. I must have watched 12 hours of football that first weekend. So glad it’s back. But, better that watching it on TV is making the trip to a campus and taking it all in. It is more than just the game. It is the pre-game. It is the BBQ, beer and playing catch before the game. It is the after parties and the bar hopping. It is also about the beautiful college girls getting out there and rooting for their team. 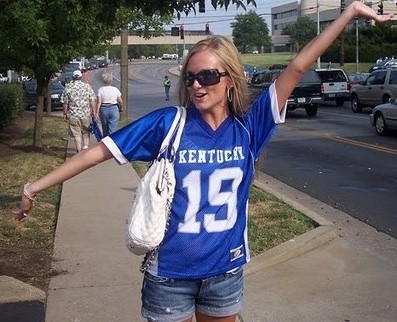 Enjoy Vol 1 of what hopes to be a several volume tribute to the hotties of college football. Things are looking good in Nebraska this year! The Ducks might have the worst uniforms in football but the cheerleaders are near the top of the list. You can’t have a college post without including reps from the #1 team in the land. Well, it doesn’t hurt that they have one of the hottest fan bases too. How did those Wolverines pull it off against Notre Dame? Was it the refs? Was it all Forcier? Or, was it these two talented split ends…ooops, I mean cheerleaders? There is plenty to cheer about Dawg fans! You beat South Carolina to get back on the winning track. Oh, and you also have HOT fans like her. To round out Vol 1 you have to conclude with Jenn Sterger. She has been out of school a couple of years now AND has changed her allegiance from FSU to USF but she is hot. What else do you need? This season looks wide open. There are a few teams in the SEC that could run away with it and win yet another national title. However, there are more than a few darkhorse teams that could sneak into the Top 10 and possibly sneak into the BCS. Here are my predictions for 2008. The Ducks have a lot of problems on offense. They will have a lot of growing up to do on the offensive side of the ball after the departures of Stewart and Dixon. The defense, oddly enough, will be the star for Oregon this season. They should be good enough for a winning record but USC and ASU on the road is tough. 8-4.